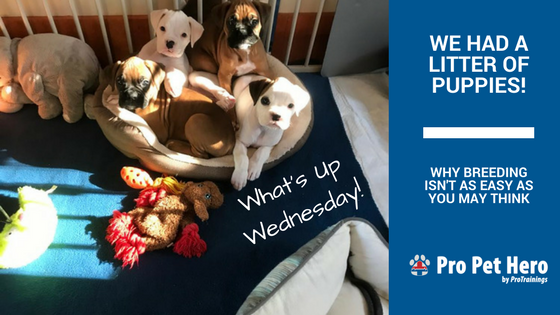 Blog What's Up Wednesday - PUPPIES! Wow, what a whirlwind of a holiday season! On November 14th we were blessed with a litter of four beautiful Boxer girls. Excited for a smaller litter, we thought managing four might just be easier than the seven we had almost exactly two years ago on November 24th, 2015 – it wasn’t. Labor lasted longer this round and after only one pup came out time started ticking without another gracing us with her presence. My poor mamma dog Debbie was struggling so after calling the reproduction veterinarian who initially was not concerned, my husband and I decided to head in. Usually, after they can birth one puppy, the rest just take their time and it goes smoothly, this was not the case. Exhausted from being up for nearly 48 hours with my labored pup (she was a trooper) my husband and I loaded her and the single pup up in the van, the temperature was at 85 to keep the little one toasty in her little laundry basket. Once at the vet, mom was picked up and placed on the ultrasound table, the vet was alarmed. A puppy appeared to be bent in half and blocking the birth canal, she also couldn’t find a heartbeat. Emergency cesarian it would be. I remember catching eyes with my girl Debbie before they took her back and then looked up at the vet and said please keep her safe. We headed off to try and get some breakfast but just shoved food and coffee down our face, trying to understand what was happening. It’s not that C-sections are unusual but we now had a much more rocky road ahead of us with healing Debbie and making certain the puppies survived. All in all, it worked out super well. We returned about 45 minutes later not only to see the one puppy we had placed in the incubator hanging out but three others. They had saved them all and Debbie would be out shortly to come feed them. Elated and exhausted we would soon get home to begin the many weeks of overlooking and assisting these beauties to grow. As I write this they are eight weeks and one day old. They are thriving, playing and destroying anything they can get their mouths on. Wee wee pads, paper towels, clothing, shoes, nothing is safe. They are a joy to see thriving and while the work to raise them has been tremendous, we wouldn’t have it any other way. While the mom dog or dam as they are called does most of the cleaning up and making certain they are safe for the first two weeks, the remaining work falls on the humans. My husband and I take raising pups very seriously and perform early neurological stimulation, the rules of seven, crate train, clicker train and potty train them. 35% of temperament is genetic, the remaining amount is what they experience in the early weeks of life. Boxers are a fun breed but they can have issues like any dog, even before we breed we do extensive health testing to make certain the mating will produce the healthiest of Boxers. So what’s my point besides sharing these beauties with you? If you decide to purchase a dog (this by no means should detract from anyone rescuing, please do), make certain you find someone that loses sleep over the wellbeing of the pups – someone that has taken every ounce of effort to make sure they not only survive but thrive. Ok, and maybe someone that puts them in Santa hats for a cute holiday card. no puppies were harmed in the making of this photo, just slightly annoyed.